Happy Spring everyone! I so look forward to this time of year. Charlie and I were just out in the flower beds, digging to see if we could find new little plant sightings. Sure enough there are lots of new, green sprouts peeking out. With Spring comes a time of renewal, a change to change things up and start fresh. 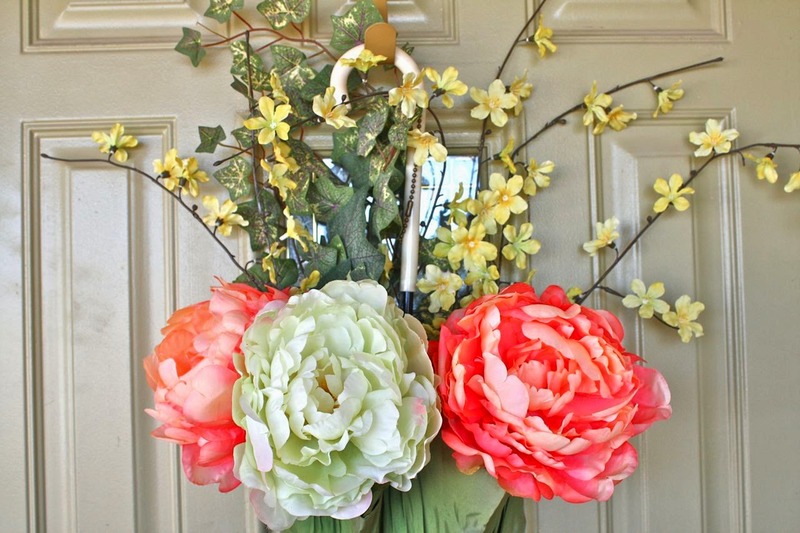 Ever since I saw this umbrella floral arrangement on the cover of a Midwest Living magazine I've wanted to find an old umbrella and do the same. I believe this is the cover photo but I'm not exactly sure...pretty close if not. This photo is pinned on my March Inspiration Board: Going Green. 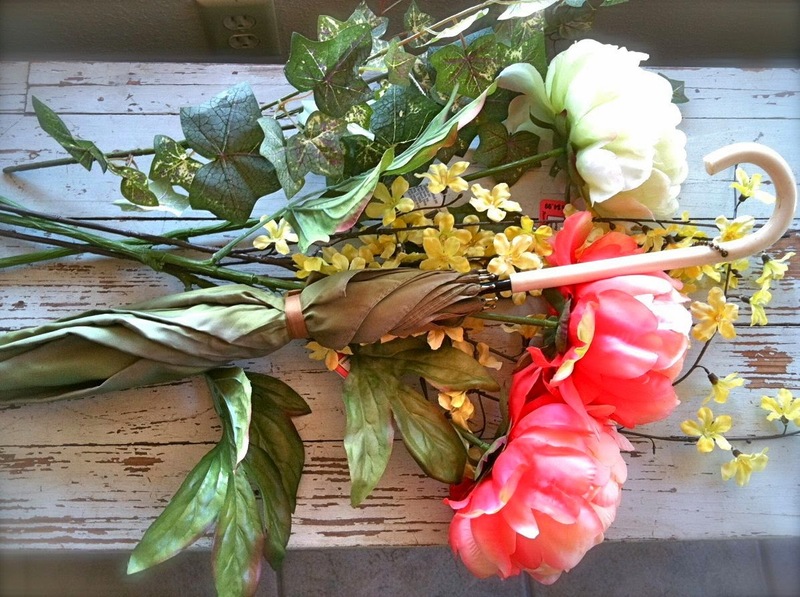 One day while out junking I found a vintage umbrella with a beautiful ivory looking handle. I knew it had to come home with me and I knew exactly what I wanted to make with it. A trip to Michael's for some fake florals and I was good to go. The girls helped me select these flowers. 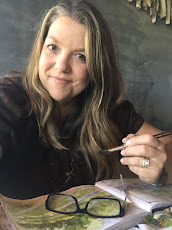 I love that they selected colors that just happen to coordinate with my color kit that I've recently been using for my Color Studio class assignments. 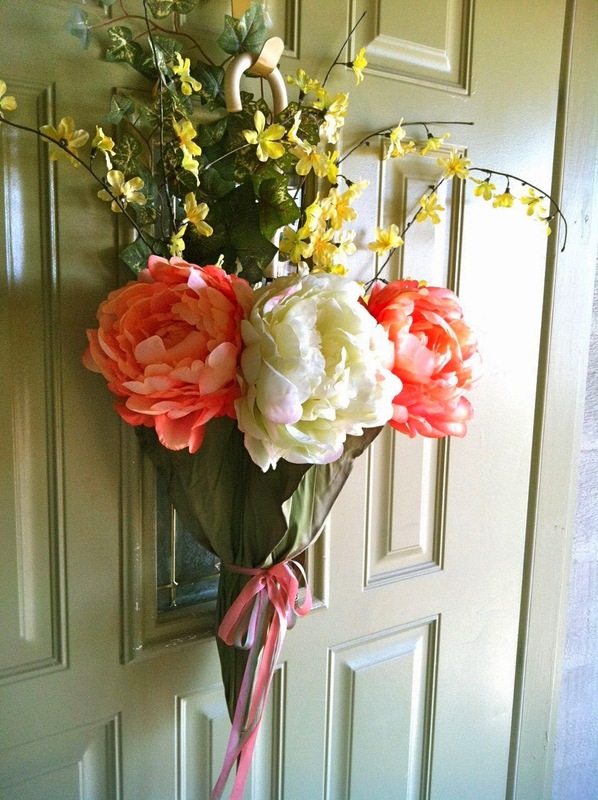 Large peonies are always a favorite flower of mine and these look pretty realistic. Here's my finished umbrella on my front door. 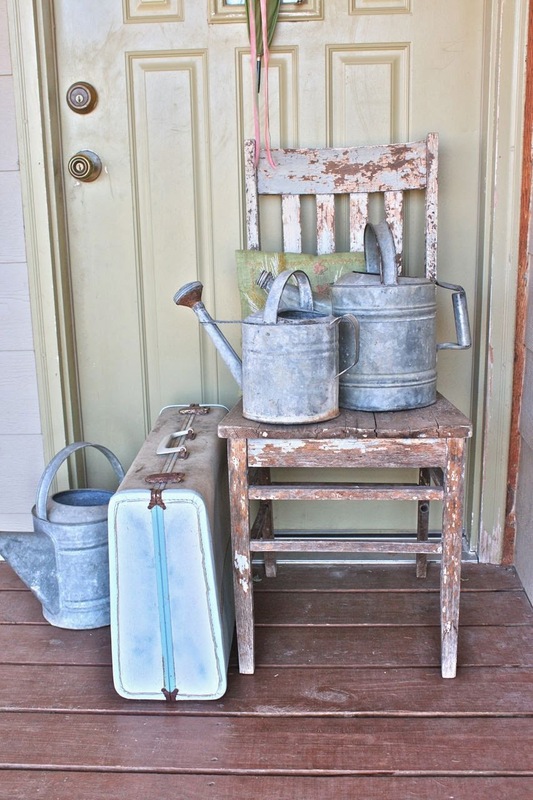 Pretty simple in nature and I added in my old chippy chair, suitcase and watering tins for a fun photo shoot. Such pretty colors and a fun welcome to our guests. I just tucked in the florals, using a few grocery sacks for stuffing here and there. 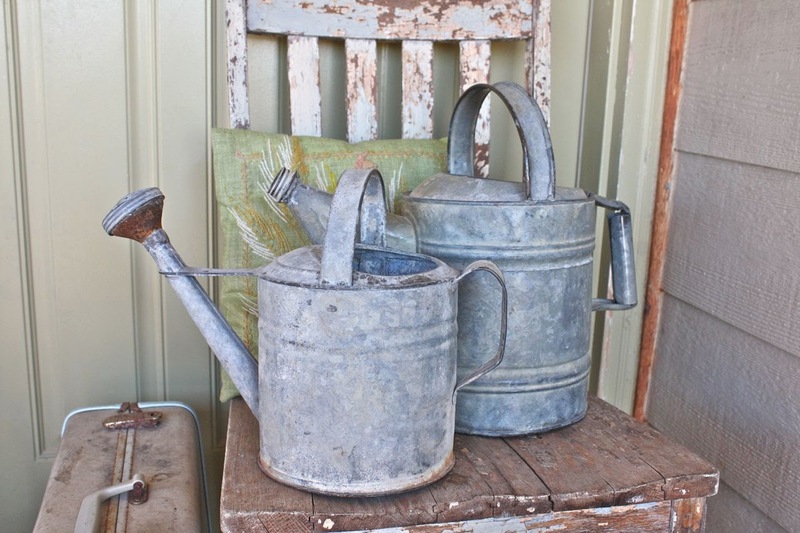 My tried and true favorites, my watering cans are like old friends to me. The suitcase? I jokingly tell friends that I keep it packed with a few of Eric's things....just in case. I'll be filling these up soon to water those first pretty flowers of the season. Bright and sunny and so welcoming. Bring on Spring...I'm so ready for you. Lovely post Michelle. It is great to know the girls are doing well. Take care of yourself too. 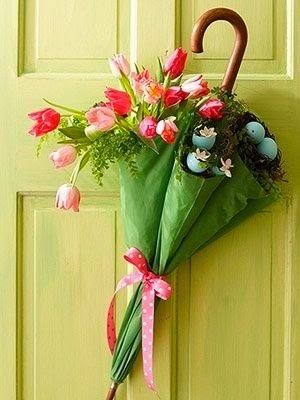 Lovely spring door decoration. 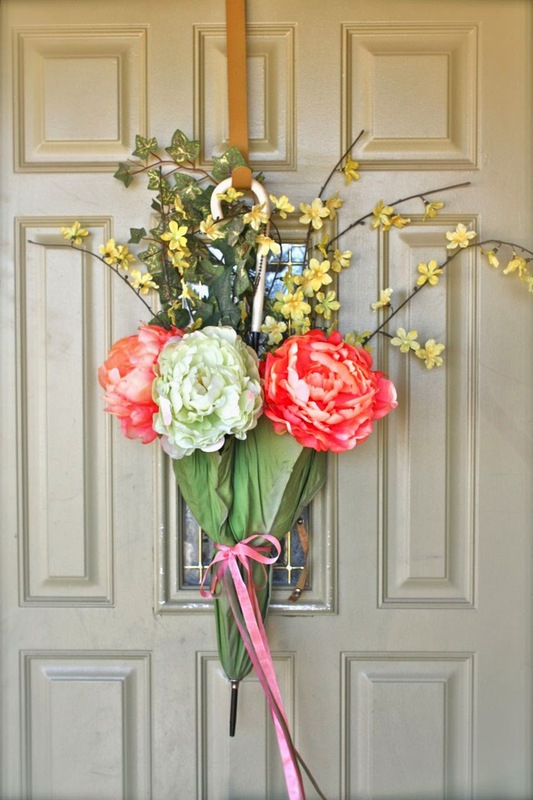 I have an old umbrella also so am going to give this idea a try for my front door. We need a bit of spring here as we got up to a bit of snow this morning here in Northern Illinois. I am happy that your girls are doing well since the accident. Hope Mom and Dad are too. Being a Mother and Grandmother, you still continue to worry about everyone. We had a lot of fog here yesterday morning and someone hit our Grand daughter as she was heading to teach school. No one hurt, but the car. Thankful for that. Take care out there everyone. Mish.....you will always worry because that's what mamas do best. My oldest turns 35 tomorrow. My youngest are twins the they turn 32 this year. We now have 3 grandchildren. Ages 8, 3, & 6 weeks. There is always a worry or two. We are blessed as I know you are. Time will help ease it a bit. Sometimes it helps to focus on what we have to be thankful for to help us keep things in perspective. What a great spring arrangement. 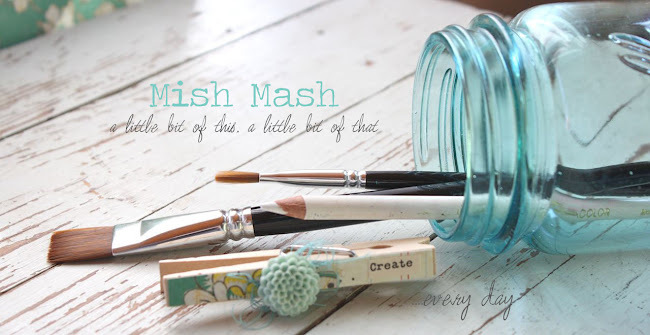 Way to see something you love and make your own version - it must make you very happy when you see it each day. I know the worrying is hard... I am a born worrier. But they are stronger now for what they've been through and so are you! Oh my, I just love your umbrella door decoration!! 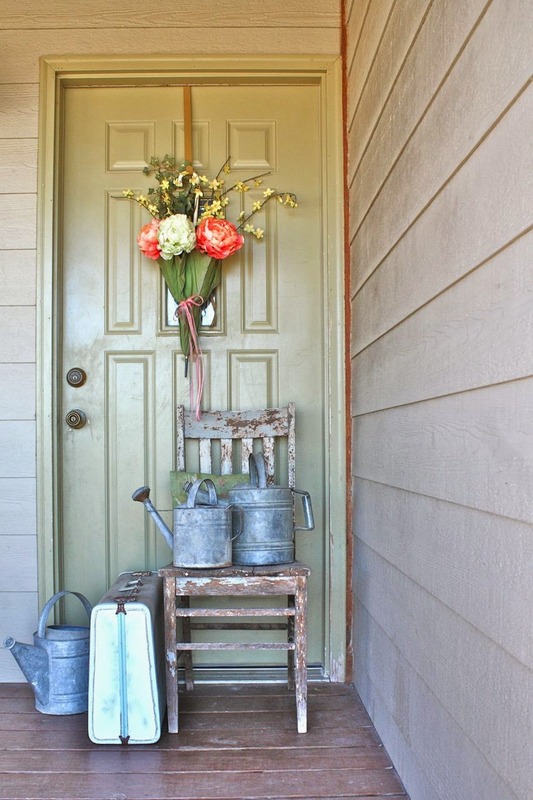 What a great flower arrangement for that vintage umbrella. I am glad the girls are doing better and thank you for all the wonderful past posts giving us updates. Have a good weekend. Diana F.